It’s not a secret that the use of wearable technology in sports is a hot topic among many of the world’s leading experts in sports and research. 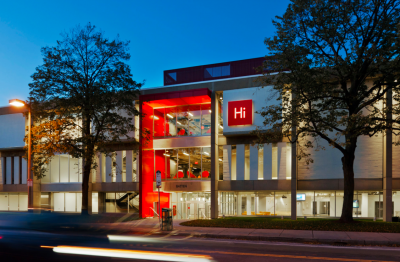 The popularity of this idea led to the creation of the first symposium of its kind called “The Rise of the Quantified Athlete.” Harvard Innovation Labs, Sports Innovation Lab, and OneTeam Collective worked together to create what is sure to be the first of many similar meetings between the world’s leading experts and innovators in sports and technology. At this symposium, there were four panels designed for informing, optimizing, and focusing the use of wearable technologies in sports and a fifth panel of elite athletes centering on their experiences with various technologies. 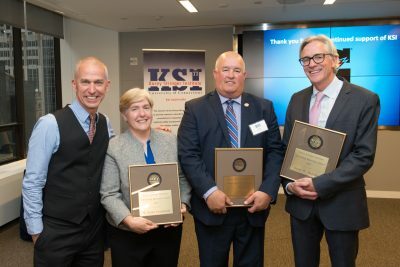 The organizations that attended this meeting ranged from veterans to up-and-coming companies trying to gain a niche in this growing market. In addition to our group from KSI, the following companies and/or organizations were involved in the panel discussions. Dr. Douglas Casa served on the third panel titled: “Software Changing the Role of Coaches and the Analysis of Athletic Performance” where he was able to discuss the importance of research in development of wearable technologies and how KSI has been involved in that research world. He suggested that every company entering this market should reach out to a third-party research group to validate their device in a peer-reviewed fashion. This type of validation will provide the company and the consumer confidence that their product works. Matt Hasselbeck (NFL, ESPN), Ryan Fitzpatrick (NY Jets), Sean Sansiveri (NFLPA), Dr. Leslie Saxon (USC Center for Body Computing), Meghan Duggan (United States Olympic Committee), Paul Rabil (MLL and US Lacrosse), Zak DeOssie (NY Giants), Shawn Springs (NFL), andCraig Adams (NHL). Overall, this symposium was an awesome start to a much larger, much needed conversation. It seemed that the general consensus with most attendees was that all of the technology and data we are now able to gather is phenomenal. Moving forward, we must all continue to strive to validate every measurement tool, make sense of all of the data these tools are collecting, and determine best practices for using this analysis to make meaningful differences in performance. This is an exciting time to be in this field, in its infancy, when the potential for growth is limitless. 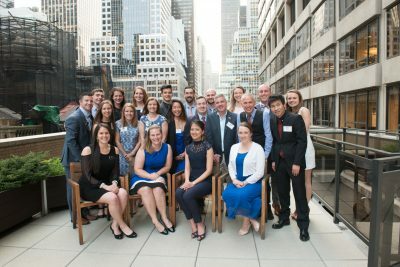 On October 13th & 14th, students and staff from the Department of Kinesiology at the University of Connecticut (UConn) attended the annual New England American College of Sports Medicine (NEACSM) conference in Providence, RI titled, “Advancing the Profession – One Step at a Time. Many members of KSI used this platform to present various topics of their interest. Yuri Hosokawa presented on LPS-induced TLR-4 activation during prolonged running and cycling events in hot and humid environments. Rachel Katch presented on the use of the heat stress score and how those can predict preparedness to run in an outdoor race. Gabe Giersch presented her master’s thesis from James Madison University which is titled, The Effect of the CYP1A2 -163 C>A Polymorphism on the Metabolism of Caffeine and Effect on Performance. Abigail Colburn presented her bachelor’s degree research about hydration knowledge and perception in DI NCAA male soccer athletes as well as the influence of water vessel on consumption and perception. 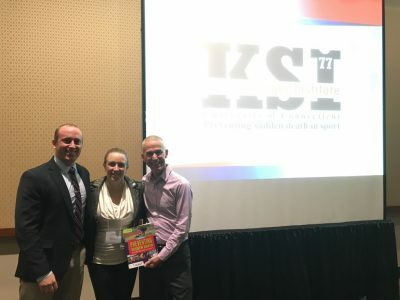 Dr. Douglas Casa, Dr. Rebecca Stearns, and Dr. William Adams presented on policy change in sport, epidemiology of sudden death in sport, how policy changes can save lives and protect athletes, and how to initiate policy changes in secondary school athletics. 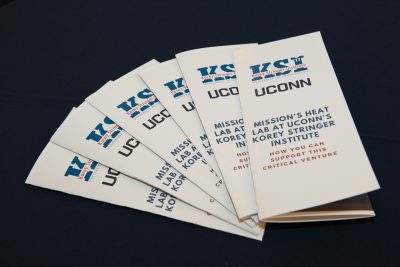 At the NEACSM Expo, UConn’s Department of Kinesiology provided information regarding its new Exercise Prescription Online Graduate Certificate Program. This program is for individuals interested in transitioning into the field of Exercise Science, Sports Medicine, Kinesiology, Personal Training, Exercise Physiology, and Health and Fitness. Additionally, this program is targeted at individuals who are looking to enhance their current job credentials or earn degree advancement. This is a 9-credit, three course online graduate certificate that can help advance knowledge base in a very dynamic field, preparing individuals to take their career to the next level. Learn about the nuances of administering exercise stress tests in healthy and unhealthy populations. Become proficient in evaluating a person’s overall health prior to beginning of an exercise program and throughout program maintenance. Understand how to incorporate aerobic, resistance, concurrent, neuromotor and flexibility exercise appropriately into exercise plans. Learn about the underlying processes involved with chronic diseases or special health conditions. Become adept at using the F.I.T.T. (Frequency, Intensity, Time, Type) principle of exercise prescription to prevent, treat, and manage these conditions. Learn how to develop individualized exercise prescriptions to increase and promote physical activity, fitness, strength, endurance, and flexibility to optimize health and meet athletic performance goals. Learn how to use behavioral strategies to increase adherence with exercise plans. Become adept at recognizing common medication classes likely to be encountered by health/fitness professionals, and how they may influence the exercise responses. The application deadline for the Spring 2017 semester is December 2nd, 2016. More information and applications can be found online at http://exerciseprescription.uconn.edu. Despite recent and proposed rule and policy changes at all levels of activity (i.e., NFL, USA Youth Soccer, NCAA, etc. ), including the now punishable act of head-to-head contact during tackling in football and the removal of heading in youth soccer, sudden death due to the above conditions can still be an inherent aspect of sport and physical activity. Participants can expect to learn imperative knowledge in the understanding of today’s leading causes of death in sport and physical activity, including essential firsthand skills in the prevention, recognition, and treatment of these emergent injuries and illnesses. With our first Sports Medicine session in the books, our curriculum has been very well received by students and has been regarded as interactive, engaging, rigorous, and very informative. Students have come away from this course with a new understanding of sports medicine and the number one causes of sudden death in sport and physical activity. When asked what was the most interesting/important thing they learned in our seminar, all responded with a resounding, “Everything!” Unfortunately, registration has closed for our 2016 seminars; however, keep a look out next year for our 2017 Pre-College Summer Sports Medicine Seminars! The Pre-College Summer at UConn program is a rigorous academic opportunity offering rising high school juniors and seniors (class of 2017 or 2018) the chance to study and live on a top-ranked public university campus. Students are immersed in challenging and intensive one-week sessions in an academic area of their choice, choosing from a multitude of topic areas. 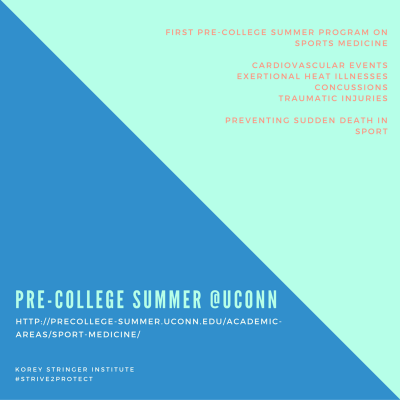 The Korey Stringer Institute is proud to announce that we will be offering four sessions of our first ever Pre-College Summer Sports Medicine course. Despite recent and proposed rule and policy changes at all levels of activity (e.g., NFL, USA Youth Soccer, NCAA, etc. ), including the now punishable act of head-to-head contact during tackling in football and the removal of heading in youth soccer, sudden death due to the above conditions can still be an inherent aspect of sport and physical activity. Participants can expect to learn imperative knowledge in the understanding of today’s leading causes of death in sport and physical activity, including essential firsthand skills in the prevention, recognition, and treatment of these emergent injuries and illnesses. 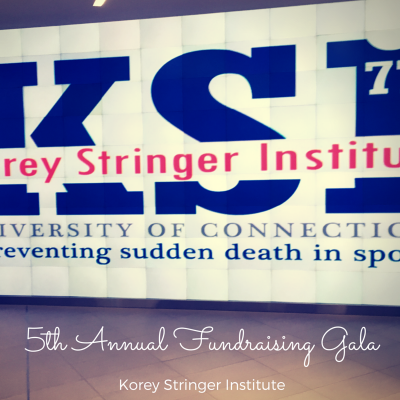 For any additional questions regarding the course’s curriculum, or the activities of the Korey Stringer Institute, please contact Rachel Katch at rachel.katch@uconn.edu. We look forward to seeing you in the summer!